Today we’re talking about a one-technique-shop again: Ouroboros Jewels. And what a technique it is indeed! Ouroboros uses the crochet beaded rope technique to create bracelets and necklaces that you can easily confuse with real life snakes. Don’t worry though, there’s no sting to them (harrumph), only the beautiful patterns and colors that we associate with the creepers. The name Ouroboros comes from Greek and it means “tail-devouring snake”. It’s a common theme that pops up in mythology now and again, like for instance, closer to our home, in the Nordic sagas, under the form of Midgårdsorm or the World Serpent, as a symbol of the immortal universe. So, it’s a very poetic and adequate name for what Ouroboros Jewels has to offer. Also very touching is the profile description that you can find here. It’s a moving slice of life of the designer, the reason why she designs the jewellery the way she does and also a brief description of the technique she’s using. Instead of giving you tutorial references for this technique, we’ll let you read that first, so go on, click the link and once you’re done browsing her shop, come back here to see what we think of it. Dandereneko: I have attempted myself this rope bead crochet, and I must say, I find it fairly challenging. They say it takes a while until you get the hang of it, and then it runs smoothly, but frankly, I think I will stick to my needle for a while before I attempt the crochet hook again. 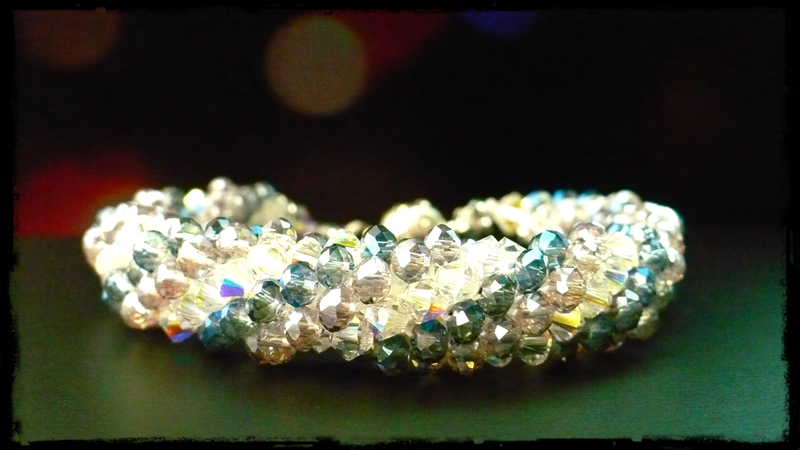 I only managed to make 2 bracelets like this, a unicolor one, with only one color of beads and one with 3 different colors that turned out something like this. There are several moments where you can go wrong, starting with reading (or even creating your own) diagram that shows you the sequence of colors. They look something like this, so yeah, I dare you, have a go at it. If you’ve managed to read the diagram, it means it’s time to start adding your beads to the thread in the said order. Our bracelet above went like 1 bead of color A, 1 bead of color B, 1 bead of color C, repeat for about 300 beads, and that’s how we got the spiral effect. But try doing something like 1A, 3B, 7C, 2D, 16E, 1A, 5E, 2A, etc for like half an hour and see if you can manage not to get it wrong at least once. Oh yeah, and the bad news is that if you do get one bead wrong, the whole pattern goes berserk and you won’t be able to tell what you were trying to make. If you think it’s been difficult so far, oh yeah, sorry to break it to you, but we’ve only been in preparation stage. After all this, it’s time to get to the actual business of actually crocheting something and that’s just another can of worms altogether. So if you think Ouroboros Jewels pieces are pricey, well, think again. We can’t even begin to imagine the amount the time, thought and work that went into creating these beauties. We also salute the fact that she’s using high quality (to be read expensive) beads in her work, including semi-precious beads. Not to mention that it will probably last you a lifetime. The bead crochet rope is more of a tube than a rope, with all the thread on the inside of the rope, protected by the glass beads on top. That makes it less prone to accidents. We’ve seen some crochet beaded ropes around the internet and on Etsy as well (and that deserves a post of its own), but the ones from Ouroboros Jewels have an overarching theme to them. Many beaders trying out crochet beading will most likely use existing diagrams, you can find so many of them online, so there’s no need to go to all the trouble of creating your own. But that takes away from the originality of the piece. Which is not the case here. Ouroboros Jewels is both unique and fascinating in the way it recreates patterns from nature. Whether they are biologically accurate, we cannot tell. What we can say is that they make for really artistic jewellery. So that’s what we thought of it. How about you? Do you agree? Write in the comments and let us know. That’s brilliant! I love the boa necklace. My best friend, Lynda Winter, is the creator of Ouroboros Jewels and I have seen how hard she works on them! It is so nice that her creativity has been so duly noted. I am the proud owner of some of her work, wear them often and get many, many compliments. I am also a friend of Lynda Winters and am the proud owner of 3 of her gorgeous pieces. I have a matching bracelet and necklace set and everywhere I wear them, people notice and comment on the beauty of this lovely wearable art. Thank you for this! I have to try this sort of thing some day. That snake necklace looks so real!